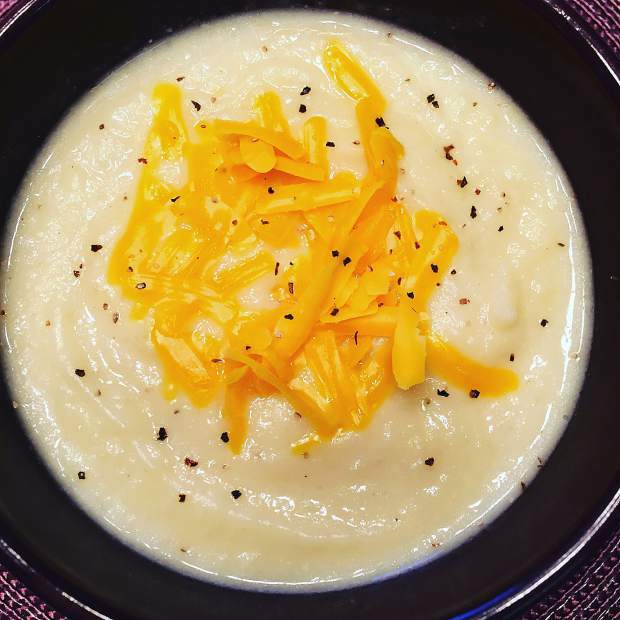 The creamy cauliflower soup is a healthy take on what would be considered traditional comfort food. Enjoy a classic comfort meal with a healthy twist. While I always enjoy a loaded baked potato soup made with pureed potatoes, sour cream and cheddar cheese, I try my best to eat healthy by making modifications for a healthier meal. This recipe uses cauliflower in place of potatoes and can easily be made dairy-free by using any milk alternative of your choosing. The cheddar cheese provides a tasty touch, but it is optional if you wish to make this recipe vegan. For an extra garnish you can add chopped green onions or crispy bacon for some added protein. Prepare the cauliflower by removing and discarding any leaves. Cut in half, then cut out the large stem, discard. Separate the florets, roughly chopping the florets and any remaining stem. Heat oil in a pot over medium heat. Add the onion and sauté for five minutes. Add the garlic, cauliflower, salt, pepper and broth, and stir to combine. Bring to a boil then reduce to a simmer. Cover and continue to cook for 20-25 minutes, or until the cauliflower is tender. Use an immersion blender, or transfer to a traditional blender, to puree the soup until smooth. Stir in the milk and cheddar cheese (after transferring back to the pot if needed). Taste for seasoning, adding more salt and pepper, as desired. Garnish with reserved, shredded cheese. Serve warm.